Residential Electrician Jackson, TN: Planning to Finish Your Basement? Planning to Finish Your Basement? Give Us a Call! A number of homeowners all across the country have an unfinished basement in their homes. The majority of those people use it as a place for storage. Perhaps it’s seasonal decorations that they keep down there; maybe the basement is full of old books that they can’t bring themselves to get rid of. Whatever the case may be, if you have an unfinished basement, you could be taking advantage of that space to make your home a better place to live. Regardless of your goals for your space, a residential electrician from Delta Electrical can help. We know that the needs of our clients will likely vary, but we can handle any job you throw our way. We are the local electricians who are licensed, bonded, and insured and there’s nothing we would love more than to help make your basement a cohesive part of your home. What Does Your Basement Need? Maybe you’d prefer to make your living room upstairs a place that you hang out when you have company over. If that’s the case, it only makes sense to move your television downstairs and create a media room. It will likely naturally be a bit darker down there, making it the perfect place to curl up on a couch and watch a good movie. Of course you’ll need lighting, however, and we can customize your space to your heart’s content. For example, maybe you’d prefer to have us install some back lights around your home entertainment center. Maybe you’d enjoy a dimmer switch so you can set the mood appropriately. Whatever the case may be, our team of licensed electricians would be glad to assess your needs and come up with the ideal solution to make your dreams a reality. Finishing your basement to your needs means you have a blank slate to work with. If your basement is completely unfinished, you can decide exactly where the walls go. This allows you to make a closet for your furnace and hot water heater. You can frame out a section for storage along an unused wall. Perhaps you’ll be using your space as a workshop. You plan to work with a tablesaw, a bandsaw, and a miter saw. You’ll also be plugging in a number of other tools on a regular basis. It only makes sense to have us come in and install outlets in strategically chosen locations to help you ensure that your workflow is as smooth as possible. If you have large tools that require the use of 220v outlets, we can handle that as well! In short, whatever you need to make your new workshop the place of your dreams, a residential electrician from Delta Electrical would be happy to hear about how you plan to use your space and help you figure out the perfect solution so that you can get the most from your space. Regardless of how you plan to use your newly finished space, the team at Delta Electrical offers high quality work at a reasonable price. You shouldn’t have to pay an arm and a leg to get a licensed electrician who knows how to get the job done right. Established in 2006, we have done work all across the country, priding ourselves on our principles of honesty, integrity, fairness, and professionalism from day one. If you’re looking for a residential electrician in Jackson, Tennessee, look no further. Of course we’re also licensed to do work in a number of other states, so regardless of the type of work done, you can rely on us in your time of need. 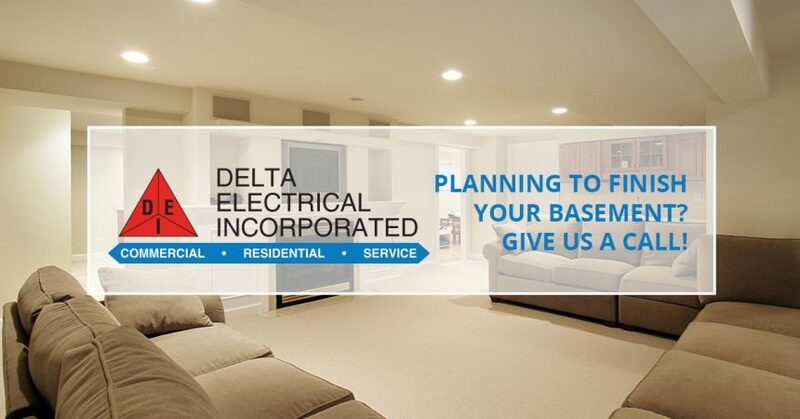 From installing backup generators to upgrading service panels to replacing ceiling fans to doing the electrical work for your newly refinished basement, Delta Electrical is the team to trust. Each member of our crew has an average of two decades of experience in the industry, ensuring that we can tackle any situation that you throw our way. No matter what the situation looks like, you can count on the team at Delta Electrical to help. Contact us online or give us a call at 731-256-7042 today. We look forward to hearing from you!